I'm going to name this race after the 48 bus route. It would basically run from one end of the route to the other. 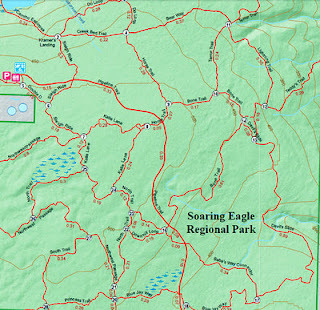 The run itself would not follow the route it would just start and end at either end of the 48. 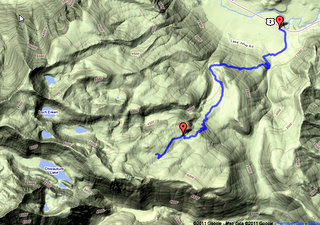 I ran about half of it yesterday as shown below on the map (19.3 miles). 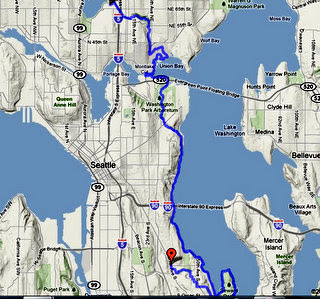 The Ultra 48 would reverse this course and continue on via the burke gilman all the way to Golden Gardens. The course would begin with a loop at Seward Park and run north along Lake Washington, running through the Arboretum, across the Foster Island Trail through UW's Union Bay Trail and Natural Area, up to the Burke Gilman out to the Fremont bridge and across, then hitting the trail and walking path through SPU, then across 15th St W to the locks, across the locks and then hitting the last section of the Burke to Golden Gardens. Or something like that. And word on the street is that I was the only one to likely finish all 50k. The course was confusing...so we all tried to run a little extra just in case. I estimate running an extra 5k-10k as when running much of the final lap with the race organizer, a man by the name of Porter, we figured out that I'd run quite a bit extra on the final half of the course..and had done so all three laps. Porter also admitted to having flagged this section of the course in the dark. Race results here.